In March of 1999, I sat in a genetic counseling office, 20 weeks pregnant with my third child. One of my prenatal tests had shown an increased risk for Down syndrome, and so we were told to make this appointment as the next step in the process. The genetic counselor turned to me, and what she said next, I will never forget. “If you are going to have an abortion, you need to schedule it within the next two weeks. After that, we can’t perform the procedure at this hospital.” My husband and I were a bit stunned by the suggestion. For us, abortion was not an option, and we quickly ended the appointment and left. Once I answered God’s call, everything just fell into place. Within less than a year, Turning Point Pregnancy Resource Center opened its doors ready to welcome women in crisis pregnancies with love and support. It has been an awesome journey over the past nine years, watching this organization grow and flourish as it meets the needs of women who are in crisis. And yet that is only part of the picture. The babies born who may not have had that chance had Turning Point not been here, the young women who have found self-worth and chosen abstinence because of a purity presentation, and most importantly, the lives that have been changed because they have been introduced to Jesus Christ as their personal Savior. I have been blessed beyond words to be a part of this organization. I look forward to seeing what God is going to do in the next few years. 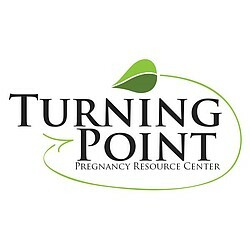 Welcome to Turning Point Pregnancy Resource Center! We are glad you’ve visited our website. We realize that the word abortion can be a divisive word. Some may say it’s a political issue, it’s a woman’s choice, it’s her body, etc. However, when women are given an option, presented in a non-judgmental and truthful manner, the gulf that seems to divide us is crossed. No matter what choice is made, they know they have come to a place where love is given unconditionally. And that is what transforms a person’s choice. We want to make more of an impact in the community and invite you to consider joining our team. We believe in making strong connections with those in our community so together we can form a network of support, service and leadership. I believe that, with your help, we can make a difference in our community and impact the culture that surrounds us. Together we can help transform the lives of women and men faced with an unplanned pregnancy and build a culture of life. Bringing Hope, Help, and Healing, to Women in Crisis Pregnancies. 1) Helping women in crisis pregnancies recognize the miraculous life within their womb using fetal development education and medical diagnostic procedures. 2) Providing parenting education and supplies to families in need through a parenting support program. 3) Educating pregnant women about church and community based services and support available to them. 4) Educating adolescents and young women and men about the benefits of remaining chaste until marriage. 5) Promoting Christ-centered forgiveness, love and healing for women and men who have chosen abortion and their families. Turning Point Pregnancy Resource Center seeks to establish itself as a known and respected community member providing services that promote a Christian world view regarding unborn life and the women who carry that life. The Bible clearly teaches the humanity, personhood, intrinsic value, and divine creation of the preborn child. (a) She is a person for whom Christ died; therefore, she deserves the Christian’s acceptance, love, and care. (b) She is accountable to God for her choices about her pregnancy, her preborn child, her own life, and her response to God. (a) Each Christian has a divine obligation to protect the preborn child and to promote the sanctity of life. (b) A Christian is called to minister to the pregnant woman and her child.